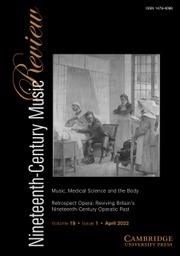 Nineteenth-Century Music Review locates music within all aspects of culture in the long nineteenth century (c.1789-1914), covering the widest possible range of methods, topics and concepts. Through themed and general issues, articles provide both depth and breadth in their contribution to this expanding field. A rich supply of book, CD, DVD, and score reviews reflects the journal's title and commitment to stimulate and advance critical discussion. Western Art Music in Japan: A Success Story?